Calling all lovers of art and food... and books! 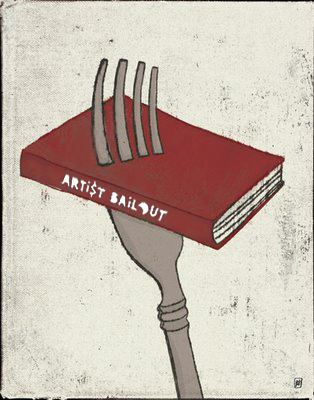 The long-anticipated next Artist Bailout event will take place on Saturday, May 26th from 6-9pm @ The Last Bookstore: 453 S. Spring Street in Downtown, Los Angeles. Sliding-scale, suggested donation for dinner and a ballot ranges from $10 to $10M (so invite your billionaire friends!) All proceeds raised will go towards funding (at least) two of the amazing projects being presented that evening. In the interest in keeping costs low and sustainability high, we'll be giving out special prizes for all Artist Bailout patrons who show up with their own soup bowls and spoons! Also, everyone is strongly encouraged to take the bus, light rail, bike, walk or carpool to The Last Bookstore. Instead, you can use those dollars you saved on gas and parking to beef-up your donation for our artists. Win-win! Thanks for supporting the Artist Bailout and we look forward to eating with you!